GregRobert Quality Pet Goes Green For Earth Day.............- CLICK HERE! As Earth Day 2009 approaches, GregRobert Quality Pet Supplies is highlighting some of the best natural, organic and green products out on the market today. For appearance sake, we will start out with a gentle, natural shampoo and conditioner that will make your pet feel fresh and smell as nice as the first spring day. First up is the Four Paws Magic Coat Nature's Organic Citrus Pet Shampoo with Aloe Vera. If you haven't yet experienced the fresh scents of spring, this Nature's Organic Citrus Shampoo will free your senses with it's delightful citrus aroma. 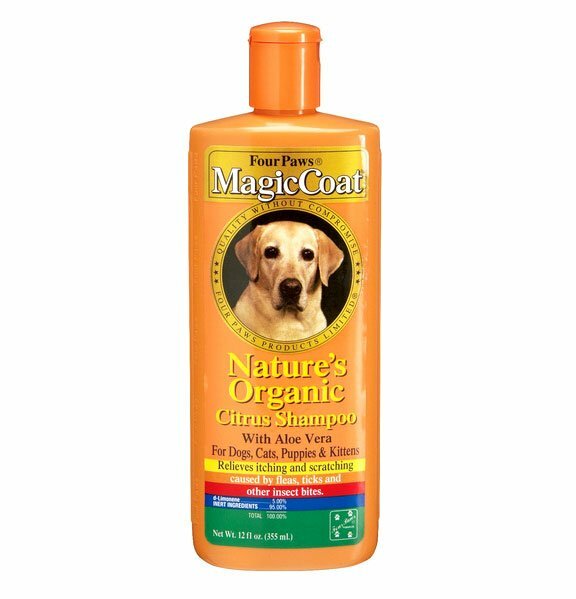 Available in a 12 oz., with Aloe Vera moisturizers, the Magic Coat Nature's Organic Shampoo is used and recommended by veterinarians, groomers and professional animal handlers. The Four Paw's Nature's Organic Citrus Shampoo is safe for use on dogs, cats, puppies and. kittens. With it's organic conditioners and moisturizers, the Citrus Shampoo can relieve itching, scratching as well as minor skin irritations, inflammation and rashes. Next Up is the Magic Coat Natural Oatmeal Conditioner. It has been proven that oatmeal contains powerful healing properties, both internally and external. Oatmeal lowers cholesterol, keeps digestive systems on track and is used as a main ingredient in some of the world's most exclusive skin formulas. Great for Earth Day or any day, the Four Paws Magic Coat products help pets keep healthy, clean and comfortable by using natural ingredients and resources right from Mother Nature. Spring Cleaning Checklist for Ponds and Pond Fish- CLICK HERE! Now is a good time to go through your spring pond cleaning checklist to plan what you will need to purchase. Check your pond for any areas that may require repairs. Remove any accumulated debris from the pond. Remove and dry the de-icer (if applicable), then store properly for next season. Inspect and replace hoses and fittings that are leaking. Start up the pond pump and pond filter in shallow water to ensure they are working properly. Replace up to 25% of the pond water with tap water. Remember to add a pond water conditioner to remove chlorine, chloramines and heavy metals found in most tap water. Examine fish for activity, ensure they are not struggling and are visibly healthy. Begin feeding according to seasonal fish feeding cycle (see to the right). Follow a Seasonal Feeding Cycle ( see the Seasonal Pond Fish Feeding Schedule pictured above)so you can easily determine the best foods to feed throughout the year as indicated by the water temperature. When you use a pond thermometer, you'll eliminate all the guesswork in fish nutrition. If the water temperature is above 5 degrees, use Tetra Pond Sticks, Tetra Koi Vibrance, Tetra Variety Blend or Koi Excellence complete. If the water temperature is between 39 and 50 degrees, use Spring and Fall Diet or Koi Excellence Wheatgerm. Environmentally Friendly Dog Toys- CLICK HERE! More and more manufacturers of dog toys are thinking of clever, new ways to help out our environment, while contributing to your dog’s enjoyment. Because of the increase in people drinking water from a plastic water bottle instead of from the tap, millions of plastic water bottles are thrown out each year. If you are an environmentally conscious dog owner that hates tossing out your empty plastic water bottles, then the Bottle Buddies dog toy made by Kyjen is the ideal toy for you and your dog. Dogs love to play with empty plastic water bottles, but once they bite into the bottle, the sharp plastic edges can easily cut into their mouth. Kyjen’s Bottle Buddies are made to solve this problem because they completely cover the empty plastic water bottle and help to prevent your pet from getting hurt. Available in a variety of fun shapes, including a pig, sheep, dog and cow, these plush dog toys are fun for your dog to play with. The toys are easy to use, just open up the Velcro closure at the bottom and insert the empty plastic water bottle. The water bottle stays securely in place until it needs to be changed. All animals are made with double thick material to prevent sharp edges from poking through and hurting your pet. The outside material is made of plush material. The best part of these toys is the great crackly noise they make with the plastic water bottle inside. Your dog will have hours of fun biting and chasing this fun, noisy toy. After the bottle loses its crackle and breaks, just insert a new one to continue your dog’s enjoyment. The old bottle can be recycled after it is cracked. Bottle Buddies make a fun and noisy toy for your dog to play with and give another use to an everyday item before it hits the trash! Check out Greg Robert Pet Supplies for Bottle Buddies and many more environmentally friendly dog toys. The Benefits of Oatmeal Shampoo for your Dog- CLICK HERE! Your dog has been scratching and licking more than usual lately and the vet recommended getting an oatmeal based dog shampoo. Your not alone! More and more, vets across the nation are recommending or subscribing oatmeal based dog shampoos because of the unique ability that oat colloids have. Oat Colloids are proven to help heal skin irritations on pets faster while at the same time, these same colloids can sooth itchy, dry irritated skin. Many of the oatmeal shampoos provide natural moisturizers and anti-itch agents which soothe skin and help to calm the sting of insect bites or other skin irritations that ar bothering your cat or dog. One of our favorite Oatmeal dog shampoos from Veterinary Formula features Tea Tree Oil. Tea tree oil is proven effective against bacterial and fungus infections on your dog's skin. The combination of the oatmeal and tea tree oil leaves your pet smelling clean with no heavy perfumes. Contains no artificial fragrances and no drying additives. Another Oatmeal shampoo that we are excited about is Magic Coat Natural Oatmeal Shampoo. This wonderful dog shampoo is a hypo-allergenic and is specially formulated to temporary relief of itching associated with minor skin irritations, inflammation, and rashes. This formula is excellent for dogs that require steroid treatments - so if your dog has been on steroid treatments or has more severely sensitive skin- this shampoo may have been recommended to you. 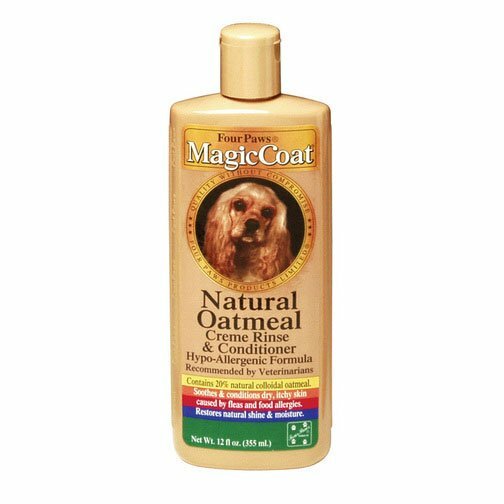 Natural Oatmeal Shampoo soothes and restores your pet's coat and skin to its natural condition for a healthier coat. Even if your puppy or dog does not have skin problems, oatmeal shampoos can relieve the bit of dryness from being out in the sun all day or just offer a special shampoo treat for your dog. Free Petfood Industry Magazine Subscription- CLICK HERE! Is the Pet Food and Pet Product industry recession-proof? Probably not and if you work in the pet industry, getting as much information on what is happening in petfoods, animal feed, and pet products is not only a luxury now. It is a necessity to keep up on trends - both good and bad. At Global Pet Expo (GPE) 2009, held in Orlando, Florida, USA, in February, the dreaded "R word"—recession—reverberated in the aisles and meeting places, just as it has in every gathering place lately. But in this case it was accompanied by another R word: resistant. As in, can we believe what we hear about the pet industry being recession resistant? Read the above article and more in the PetFood Industry Magazine. Get your free subscription today! Best-in-Class pet product warehousing companies have reduced their detention and demurrage costs over the past 12 months. Best-in-Class pet product warehousing companies are 3.3x as likely as all others to turn-around orders the same day they are received. Best-in-Class pet warehousing companies are 2.3x as likely as all others to have decreased their inventory carrying costs over the past year. Feed Management Magazine is a business journal for people involved in the pet and animal feed industry. Whether you are involved with pet food, horse nutrition or swine feed - it is a great magazine to get. It is published 6 times annually and is a free journal fo in-depth coverage of animal and pet feed production technology and animal nutrition. Achieving order-to-delivery excellence in the pet industry - a white paper that is a must read for warehouse and procurement professionals. Walking the dog with the right Leash - Retractable Leashes- CLICK HERE! The weekend thus far has been beautiful, here in Michigan. Instead of our quick twenty minute walk, Jake and I took an hour long walk/run. The sky is beautiful, sun is shining and it's a crisp 55 degrees. Perfect walking weather especially after our VERY cold winter. Pictured above to the right is the type of retractable leash that I use to walk all of our dogs.n It is the Comfort Grip Retractable by Flexi. Flexi is the king of retractable leashes featuring Giant Retractables, Mini Retractables, cord retractable leashes and others. The mechanisms never fail and the grips are extremely comfortable even when you have dogs that pull alot. Flexi style retractable leashes are great to allow your dog or puppy a bit of exploration room at times and stricter control at other times (like when you may be crossing a busy street - or walking across a neighbor's lawn). Stronger and aggressive dogs may not do well with a Flexi-style retractable leash. Flexi also makes a great retractable leash flashlight attachement. It has a built in flashlight that is operated by the user. The incorporation of the flashlight removes the need for the pedestrian to carry a separate flashlight in the opposite hand for the purposes of illuminating the walking path or site and to alert others to the presence of the user and pet. By encompassing both a retractable pet leash mechanism and a flashlight, the user is permitted a greater degree of safety and higher visibility of the pet, the user, and/or any feces left by the pet, which the owner may be responsible for. Walking your dog is great for your health and great for your dog's health. Don't let an inferior leash get in the way of enjoying your walk to it's upmost. Get a comfortable, retractable leash and enjoy every minute that you can walking your dog in complete comfort! Help! My Dog has Ear Mites and is Constantly Scratching!- CLICK HERE! Ear mites are an external parasite that can infect rabbits, dogs, cats, puppies, kittens and more rarely, humans. Picture to the right is Durvet's Ear Mite Solution which is great at killing ear mites. The mite's name that attacks the ear is Otodectes cynotis. Otodectes mites are large enough that they can sometimes be seen with the naked eye and are easy to see with magnification. Ear mites live in the ears and on the skin of pets infected with them. The mite lives its entire life on the dog or cat and it takes about three weeks for a mite egg to develop into an adult mite. The adult mites are very fast and mobile and can live for quite long off of a dog or cat, which enables it to be contagious and easy to pass between pets. The most common sign that your dog has an ear mite infection is shaking of the head and ears. Dogs may also scratch at their ears, rub their face with intensity and in bad cases may even cause bleeding behind their ears in their effort to relieve the discomfort from the mites. The itching associated with mites is thought to be due to a hypersensitivity reaction, which is similar to an allergy. Some pets can be infected without showing signs of itching or head shaking, because they don't develop the hypersensivity reaction. Ear mites are more commonly diagnosed in cats than they are in dogs but they are a significant cause of ear infections in dogs, too. Dark brown to black gunk accumulates in the ears of infected pets and the mites may be visible as small moving white specks on the gunk. Secondary infection with bacteria or yeast is common in ear mite infections and will complicate the diagnosis of an ear mite infection. The mites can live on the skin and some dogs and cats appear to have infections that affect only the skin, causing small sores to develop in affected areas. It is important to treat the ears for mites and the whole pet with a product that is capable of killing the mites. Most flea and tick products will kill ear mites on the skin. In multiple pet households it is important to treat all the pets and to clean the environment, considering the use of premise control or area foggers insecticides in persistent cases. Ear mites are susceptible to many medications, including pyrethrins, rotenone, fibronil, thiabendazole and ivermectins. It is necessary to treat for at least three to four weeks in most instances to be sure to kill the adult mites and any eggs that may hatch later. Many veterinary clients treat their dog's ears with over the counter products for ear mites based on the presence of ear inflammation or exudate in the ears, doing this for weeks or months prior to giving up and having their dog's ears examined. There are a number of causes of ear infection in dogs and it is best to have your vet examine your dog's ears to determine if the cause of ear irritation is ear mites or another infection. Doing this can save your dog from weeks of pain or discomfort. Help contribute to a better world by keeping your dog happy!- CLICK HERE! Everyone and anyone can make a difference in helping to improve our Earth and the environment that we live in. It is important to help in any way that you can and every time you help out, the Earth’s environment is improved. From purchasing energy saving light bulbs to conserving water, every little step you take has an impact on the environment. Even your dog’s toys can have a positive impact on the environment. Sergeant’s has partnered with the National Wildlife Federation (NWF) to create a fun and effective way for any dog owner to easily contribute to helping the Earth’s environment and wildlife. Every time you purchase a Protected Wildlife Series dog toy made by Sergeant’s, you help contribute money to a worthy cause. After you purchase one of the cute and soft plush toys in the series that is available at GregRobert Pet Supplies, you register the toy online on the Sergeant’s website and a donation is made to the NWF for the protection of animals. The animals in the series are from a specific area of the world that needs protection. Choose from the North American Bison, the Arctic Life Polar Bear or the Rainforest Jaguar. Each animal is made of soft, plush material that your dog will love to snuggle or play with and is very durable. Your dog will have hours of fun playing with these environmentally friendly toys, while you help out animals in another part of the world. So, the next time you purchase a toy for your dog, think about getting one or all of these wonderful toys by Sergeant’s and help make the world a better place for us and the animals! Presidential Pick- The Portugese Water Dog- CLICK HERE! The First Family has finally made it official- some lucky Portuguese Water Dog will soon be placing it's webbed paws on the front steps of the White House. According to an interview in this week's People magazine, Michele Obama stated that one of the reasons they choose this breed is because the the Portuguese Water Dog is known to have a hypo allergenic coat. The Sneeze Free Dog Breeds is the only book on the market dedicated to pet-related allergy issues. This helpful book includes information on managing allergies and finding the perfect breed for a sneeze free life. The Sneeze Free Dog Breeds was written by Diane Morgan, and includes an extensive section of in depth breed profiles on 21 hypoallergenic dogs. As an animal lover, dog owner and allergy sufferer, I completely understand the research and decision making process it took the First Family to finally pick which dog breed best suits their needs. In fact, I salute them for thoroughly investigating the benefits of a hypo allergenic breed, such as the Portuguese Water Dog, prior to announcing their decision. When purchasing a pet for the first time, I believe it is essential to learn as much you can about the breed, it's temperament, life span...etc... I was considering a Bernese Mountain Dog as my next dog, but after researching this breed, I learned that the average life span of a Bernese is only about 8 years old due to its large size and propensity towards hip and leg problems. I wasn't happy to read that, but I was glad to know that was a factor with the breed. This will be a major consideration in my decision making. I believe that too many people bring pets into their homes without preparing. Think back to when Eddie the Jack Russell terrier was THE dog to have due to his cute antics on the popular television series Frasier. Many people loved Eddie and wanted a Jack Russell because they saw how Eddie acted. It's true that Jack Russell's are very smart and can be trained to do amazing tricks. However, they are also very high strung, need constant attention and need to be properly trained to do those tricks. Another example of a dog breed made popular by movie proxy was the the Dalmatian. After the 101 Dalmatians movie came out, everyone was just dying to get a Dalmatian puppy. When families found out that the cute spotted puppies which behaved so well in the movies were in fact a very needy breed, animal shelters across the country began to fill up with Dalmatians. As pet owners, we are responsible for taking proper care of our pets. Period. There is a ton of information out there regarding any breed that you desire. Please think about adopting, rescuing or even fostering a pet prior to purchasing a particular breed. Even the "mutts' at the shelters have a mixing of breeds, and it is our responsibility to ask what type of dog we are receiving. Every dog breed will have it's own book. If purchasing a book is out of your budget, check the local library. All it takes is a little research to see if the breed you like is the right fit for your circumstance. I personally have friends who own a Portuguese Water Dog named Tess. My friends live on a lake here in Michigan and Tess is now 4 years old. She is adorable, affectionate and busy, busy, busy. Tess obviously loves the water and even runs out on the ice when the lake is frozen. She is constantly fetching things, playing with her dog toys and cuddling up to anyone who will give her attention. Tess is loved, well cared for and was placed in an ideal living situation for her breed. I believe the Obamas have made a good choice and I'm glad they took their time in choosing a dog that will fit right in with America's First Family. For more information about The Sneeze Free Dog Book and other dog breed books, please visit www.grpet.com. About the author of Sneeze Free Dog Breeds: DIANE MORGAN is an ardent supporter of canine rescue and a charter member and Treasurer of Basset Hound Rescue of Old Dominion. She is the award-winning author of many books, including Good Dogkeeping, The Simple Guide to Choosing a Dog, and Feeding Your Dog for Life. She is a college professor of philosophy and literature and resides in Williamsport, Maryland, with seven dogs, two humans, and an uncounted number of goldfish.